NC-Hype Under-Construction Template elegant versatile under-construction template. It helps for hyping your next up coming ideas. 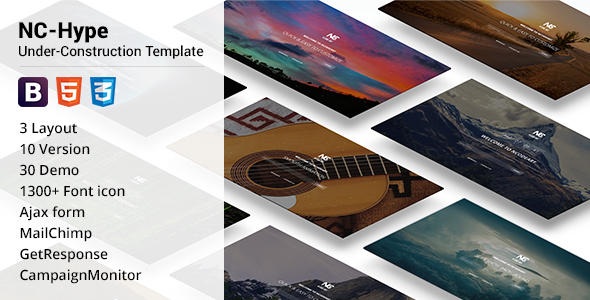 NC-Hype Under-Construction Template come up with 3 layout and 10 version including effects for different slideshow effects, Kenburn, YouTube video background, Particle effects and many more. Also different features like AJAX form, countdown timers, portfolio gallery and many more features. NC-Hype Under-Construction Template integrate with mailchimp, Campaign-monitor, Get-response as well as offline file mode.